How times have changed. Back in 1997 when IBM wanted to convince global businesses that newfangled IT systems could help them, it spent $40 million with Ogilvy & Mather on TV spots, radio, and some banner ads. Today IBM is shaping opinions of itself with the new site IBM.com/think, which combines 90% rub-your-chin content in the style of The Economist or Harper’s with about 10% self-promotion. IBM steers clear of politics and instead pushes science-report-toned entries on food, cloud computing, energy and the environment. The site is fed with banners around the web and dovetails with social media outreach on blogs, Tumblr, LinkedIn, and Twitter (nicely run by real IBM humans @adamclyde, @jhodge88, @junkstar and others). Using quasi-editorial copy for corporate messaging is nothing new; Mobil broke the ground on this with its quarter-page, black-and-white NYT Op-Ed ads in the 1980s. But this feels different both in non-salesmanship of copy and in nuanced outreach. Tech blogger Robert Scoble calls this communication strategy a “starfish approach,” where various arms reach far into the web to give your audience multiple ways to receive and engage with your message. Perhaps the growing transparency of social networks, coupled with consumer skittishness of being sold ideas by corporations, is requiring large companies to provide more-objective value in their content. A decade ago IBM was a distant monolith. Now we can ping IBMers by their personal Twitter handles. That makes us think. Interesting. I had not been aware of the site until your post Ben, nut then maybe I’m not the target audience. Like all content plays, this one is going to depend on how good the content is. Is it getting quoted and linked to by others? Ate people sharing it with their friends. The Mobil ads sat on the op Ed page of newspapers where we couldn’t help put see it. If the IBM content isn’t first rate and if the site doesn’t become a valid news site, then no one will ever see it. Good point. 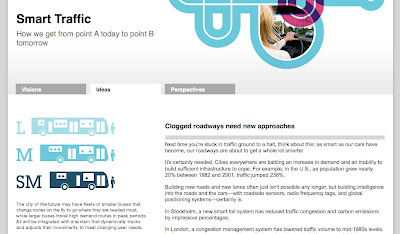 This feels more like a long-term positioning play, a la BP moving “beyond petroleum,” than a one-off tactical campaign: IBM’s way of relaunching a version of its site to business decision-makers by setting up a broad network of content. I actually found the content intriguing. Given the pressure on real publishing these days, wouldn’t it be intriguing if large corporations with budgets could create content as compelling as old-school media?